Spoiler warning – this essay will discuss plot points, including Shadow of the Colossus’ ending. Dormin: But heed this, the price you pay may be heavy indeed. Shadow of the Colossus defies categorization and expectation. The 2005 game from Fumito Ueda’s Team Ico has all the elements of a big budget title, with graphics that stretched the PlayStation 2 to its limit, and a stunning orchestral score. But there are no dungeons to crawl, no side quests to tackle. What is this game about? Distilled down, Shadow of the Colossus can be described as a series of epic boss battles, combining elements of platforming and puzzling. 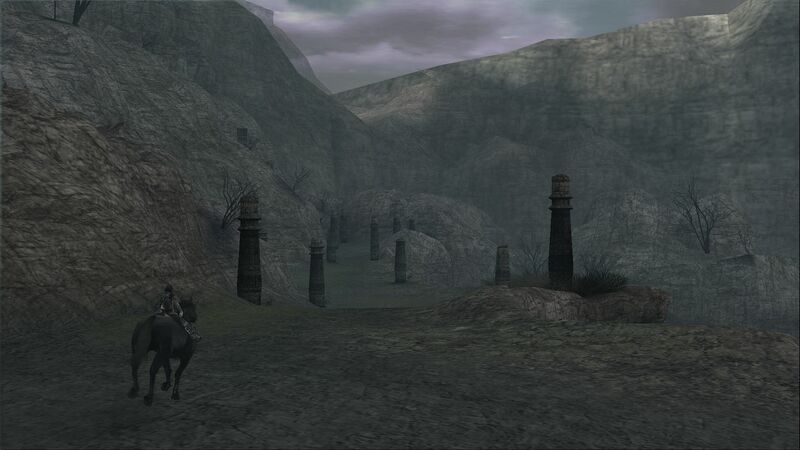 Finding the colossi in this massive game world is relatively straightforward – your Ancient Sword focuses light, pointing the way to the next encounter, and you travel across this serene world on your horse, Agro. The colossi are a technical wonder – giants of stone and fur that are both inscrutable and vulnerable – and Team Ico’s imagination and sense of scale is on display through marathon confrontations: a bird of prey that barrel rolls through the skies in an effort to throw you from its wings; a sleeping knight that mistakenly shatters its stone sword; a writhing eel that is rendered defenseless once you hack away at its electrified antennae. Though they are tense and visceral (you’ll grip the right shoulder button tightly to grab and cling onto the giants), the battles with the colossi are not the only memories from Shadow of the Colossus that will stick with the player. In between these clashes, the developers afford you breathing space to reflect on your actions. Riding through beautifully envisioned autumn forests, windy canyons, and blasted deserts – in these isolated, meditative environments your mind will draw back to the colossi you have defeated. As the broken stone bodies pile up there is a growing realization that these colossi are innocent; that there is something detestable about your violent actions. And you are not just a witness, nor even an accomplice – you are the perpetrator. Video games are all about control, and Shadow of the Colossus takes full advantage, conveying a feeling of disproportionate power as you charge up attacks and drive your sword into unprotected limbs and skulls. The player feels the colossi roar in pain. No other medium can so well convey this horrible feeling. These gentle giants are sympathetic, pitiable. Though some can retaliate, their movements are typically lumbering. Once you have clambered onto their massive bodies and uncovered the weak points concealed between armored plating, they are largely helpless, reduced to shaking and writhing in a desperate effort to dislodge the player. Argus tends to his wounds. Artistically, Shadow of the Colossus reveals the toll of battle in subtle ways. Mournful music accompanies every defeat of a colossus. Team Ico have created a score that is beautiful, eerie, and tragic all at once. Shadowy human figures – corresponding to the number of colossi killed – stand in silent judgment around the unconscious Wander. 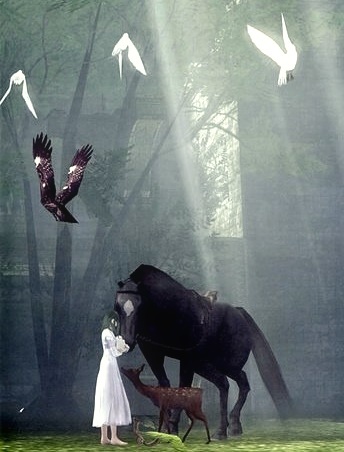 White doves – also equal in number to the fallen colossi – gather at Mono’s altar. And the intricate stone statues that stand for the colossi shatter after each battle, leaving the shrine in ruins. I can’t remember at what point in the game I realized that Wander’s face was rotting. The decay happens insidiously. Every win takes something away from you. By the end, Wander’s tunic is tattered, dirty, and he looks as though poison is powering through his veins. His battle scars are evidence of a deeper corruption. Video games have an issue with violence. Games built around the concept of shooting, killing, destroying are ubiquitous. How many games have we played as the “good guy”, and how many enemy characters have we felt justified in killing? Consider Assassin’s Creed – big budget blockbuster spectacle infused with a post-colonial, multicultural viewpoint. In a refreshing turn, with Assassin’s Creed we are on the side of history’s downtrodden, in eras where violent imperialism is strongly criticized. But in these games, as in scores of others, the body counts amassed by the player are so staggering that it undercuts much of the point. Death of Quadratus, Shadow of the Colossus’ second boss. If it’s hard to empathize with a trained assassin, then it’s nearly impossible with Wander. Enemies in other games are cannon fodder, they are disposable. In Shadow of the Colossus, you are impacted by each creature. The developers do not let the player turn away from the destruction they’re inflicting. At game’s end, the body count stands at sixteen. These killings carry weight. Shadow of the Colossus conveys the guilt and shame associated with pointless violence better than anything else I’ve played. And then there’s the ending. Soldiers led by a shaman named Lord Emon arrive on horseback too late to prevent the fall of the last colossus. Returned to the shrine, Wander, now appearing possessed, pale and scarred, and with horns sprouting from his head, stumbles towards Mono in his final moments. You were only being used. Eradicate the source of the evil. Meeting the same fate as the colossi you destroyed, you are run through with a sword – and like the colossi, Wander sprays out black blood, his body moldering rapidly. Dormin’s warning at the beginning is fulfilled. Revealing that his body had been “severed… into sixteen segments for an eternity in order to seal away Our power“, Dormin exacts his payment – possessing Wander’s body, transforming into a horned colossus. You are the colossus. The consequences of your actions are brought into relief by Team Ico’s ingenious design, as the developers flip the gameplay around on you. You are returned control of Wander/Dormin, and as Emon’s soldiers fire arrows you understand what those sixteen giants suffered. As a colossus, you are not nimble enough to dodge the arrows, not quick enough to land any attacks. Nietsche’s aphorism in a literal sense then, but the analogy does not fit exactly. 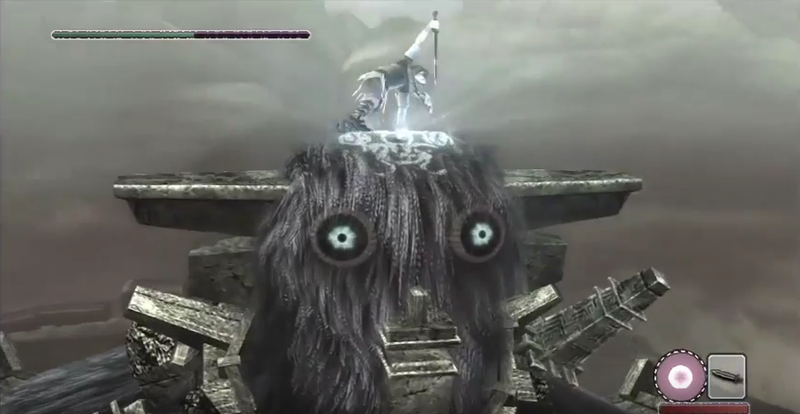 The colossi were never the real monsters, and the abyss (in the form of Dormin, or Wander’s own selfish aims) stared into the protagonist at the game’s beginning. As the soldiers escape, Emon throws the Ancient Sword into a pool of water at the heart of the shrine, creating a portal of light that strips Wander of his colossus form and envelops him. But Dormin was not completely false. Making good on his end of the bargain, Mono is resurrected, along with Agro, who had bravely sacrificed herself to save Wander before the final battle. As Mono returns to life, the evocative music from the introduction sequence reprises, brilliantly bringing the story around. The credits roll and we see each colossal corpse in turn, now fossilized, now part of this strange landscape. Poor ungodly soul… Now, no man shall ever trespass upon this place again. Should you be alive… If it’s even possible to continue to exist in these sealed lands… one day, perhaps you will make atonement for what you’ve done. Mono finds Wander, now a baby with horns, the third part of the trinity to be resurrected. Together with Agro, they climb to a garden at the top of the shrine. We see their final scenes in this beautiful place, accompanied by a fawn and doves, and the most optimistic music heard throughout the game (the score accompanying this sequence is titled “Hope”). A first reading of the game’s ending may see Mono, unaware of her surroundings, and caring for a demonic child with horns, trapped for eternity in an empty temple and an empty world. But a second reading reveals a chance for redemption. Maybe Emon’s prayers and the pool of water have cleansed Wander, and there can be absolution in this strange world. What was Wander’s sacrifice for? Was this the selfishness of an obsessed outsider trying to prove his worth, or the selfless act of a man attempting to save the soul of his wife, no matter the cost to his own? 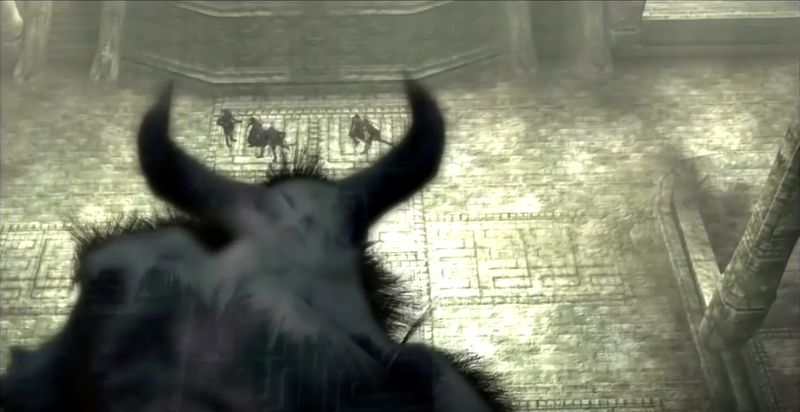 Shadow of the Colossus haunts the player with questions – about the ambiguity of Wander and Mono’s relationship; about the god or devil Dormin in his prison; the future for Mono and the child; and how this world links to the team’s earlier Ico (2001). In the end, you will finish the game full of regret over your actions, and what amounted to an empty series of senseless, pointless attacks. Shadow of the Colossus confirms its status as a modern classic in the finale, driving home with the same force as the sword that you have wielded to great destruction. Team Ico achieved something here unlike any other game I can think of. A unique, artistic, even spiritual, vision of sacrifice and corruption, Shadow of the Colossus is a rich allegory of a deal with the devil that sets the player up for a long fall. With Dormin’s warning to Wander, the player knows from the start there will be no happy ending – a tragedy in the truest sense. As Wander, you are cast as the tragic hero, with all the conflicting emotions that come with taking the wrong path. Shadow of the Colossus will leave you thinking on your actions, even more so with a second playthrough, but this is a desolate journey worth taking. Originally released on PlayStation 2 in 2005, Shadow of the Colossus was remastered in HD and released for PlayStation 3 in a bundle along with Ico in 2011. Unfortunately I’ve never owned the game, thus I’ve never finished it. I did play it a lot in a video game store when I was younger, though. If I had the money back then I would have bought it, but I think if I had, a lot of the meaning might have gone over my head.